Throughout history men and women have tried to tame God. I liken it to damming a river to control the normal flow of the water. What’s possible with rivers is also possible in religion. A group of people can claim that a portion of the river is theirs. They construct dams to control the living water, pave a parking lot, pop up a building, and hoist a sign with a catchy company name. Let’s call ours Choppy River Church. The river is real, but already altered by the dam. Domesticated. Cultivated. Tamed. 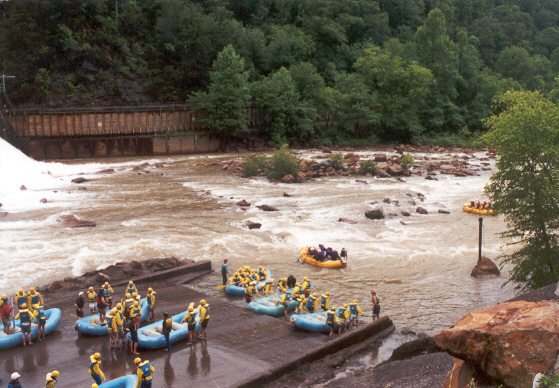 Choppy River Church advertises, “Come whitewater rafting on God’s true river of life!” When you arrive, you’re handed a life jacket with the company logo, then shuffled to the formal boarding area where you step into a raft emblazoned with the brand name. Reps from the company man the rafts and guard the shorelines. If your raft catches an unexpected rapid and sends you off the man-made course, workers on the shore use long poles to push you back where they want you. The river is so controlled it no longer represents who God is. When your ride on that short section of the river is over, you are expected to gratefully disembark and say complimentary things about the company. And its management. And the exciting river. Any honest reactions to the adulteration of the river are quickly met with disapproval from peers or company leadership. If you still don’t comply with the unspoken codes of behavior, you are summoned to a meeting for a stern rebuke. Those inclined to question or resist further find themselves evicted from Choppy River Church. If that sounds familiar, you might think you were rejected from the river of God BY God. But that’s not the case. Not at all. There is a river that extends far beyond the trifling range of Choppy River Church. There his river is unaltered by man. The water is unrestrained. Exhilarating. Powerful. Potent. Anyone is welcome at any time. People who gravitate to it are inclined to respect, love, and treasure the river. They bring rafts and ride the waters at will. Rafters come and go much like nature lovers come and go from the earth’s forests, deserts, and mountains—they leave it like they found it. Spotless. Pristine. Natural. Wild. The river is available for all, but owned by none. 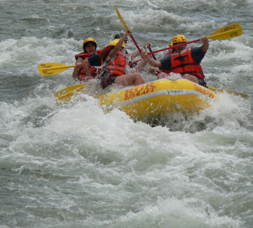 Even those who work there full-time as whitewater rafting instructors don’t assert it’s theirs. Those who choose to frequent riverside buildings do so to exalt God together. And to support each other. Nobody aspires to subdue the river. They wouldn’t dream of exploiting it for profit or power. They value it for what it is: Bigger than man. Mightier than man. Unpredictable and fearsome. But, paradoxically, also soothing. Calming. Restful. Healing. Choppy River Church does not equate to God. They are not one and the same. A place that claims his name might be contrived, but he is not. He is infinitely more than a controlled, tamed, ineffectual river, and yours for the asking.